The busy area of Fort Worth, Texas sees a lot of traffic and commuting. Drivers come through here from all over, drivers who live here go all over, and the Dallas/Fort Worth area is always crowded. Because of all the driving that happens in this area, the likelihood of roadside complications goes up. With more drivers on the road, the likelihood of accidents or complications goes up. Traffic can be hard on vehicles and can cause them to malfunction. Just having a vehicle puts you at risk of needing help at some point. But that’s what we at Towing Fort Worth are here for. We and our network of independently owned and licensed affiliates provide an extensive range of towing and roadside assistance services in Fort Worth so that the residents here know who to call when they have a problem. We and our network of independently owned and licensed affiliates serve vehicles of all makes and models, so it doesn’t matter what you drive. With our affordable rates, 24/7 availability, we’re here for you no matter what you need. Towing Fort Worth offers complete towing services throughout Fort Worth TX. We consist of highly qualified tow truck operators who can effectively carry out the towing services and roadside assistance you need. Call our 24 Hour customer service line at (817) 886-8332 and we can arrive extremely fast from your call! Is your car out of gas? Your car won’t start? Experiencing a car lockout? FW Towing Fort Worth works every hour of the day and night to make sure you receive the tow car services and roadside assistance you need! We offer competitive pricing not only for a car tow, but also roadside assistance and any car lockouts needs! In a roadside emergency, the last thing you should worry about is cost. 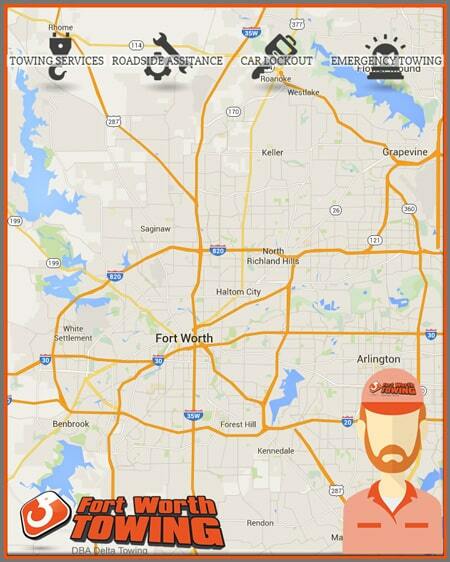 FW Towing Fort Worth is a reputable and certified tow truck company you can trust. At one point your vehicle may fail you entirely. You may be in an accident that you can’t drive away from, the car battery may die, or some other problem can arise where you can’t drive your car. There’s an easy solution for this – call Towing of Fort Worth. Our technicians are all in the area and can quickly get to your location to provide you with a tow. We offer local towing, long distance towing, wrecker services, dolly towing, flatbed towing, motorcycle towing, accident removal, and more. If you find yourself with a flat tire on the freeway, don’t try to change it yourself. Call us for roadside assistance services and we’ll safely, expertly, and efficiently do it for you. We offer all kinds of roadside assistance, from car battery jumpstart to gas delivery to flat tire fixes. We will bring the shop to you on the side of the road so that you don’t have to try to find a way to get to us. Sometimes your emergency situation is that you’re having complications with your car’s locks, keys, or ignition. When you are in need of car lockout solutions, we have them. We can repair or replace your broken or malfunctioning locks. We can replace your keys for you. We can open your trunk for you, do professional lock picking if your keys are inside your locked car, reprogram transponder or chip or switchblade keys, or extract a broken ignition key and replace it. Emergency services are the most common service we get called for, and we’re more than prepared to handle them. We know that most of the problems you face on the road are unanticipated, and we also know that you probably have important places to be. We’ve trained our technicians well so that they can provide expert emergency solutions in a quick and efficient manner to get you back on the road. All services are available in the following cities in or around Fort Worth, TX: Arlington, Bedford, Grapevine, Haltom City, and more! Call us now at (817) 886-8332 and a certified tow truck operator can arrive fat to your place! The professional auto mechanics we work with are the best in the auto towing industry. They are technologically up to date with the latest car towing equipment and keep current with auto towing and car lockouts industry news. Our flatbed tow trucks and trucks with a tow dolly are well maintained to ensure a high standard of service. Emergency Towing Services: Towing Fort Worth provides 24/7 Emergency towing services day or night at (817) 886-8332 for all types of vehicles – tow truck , motorcycle tow and any towing service you may need – accident removal, long distance towing, and more. Why Choose Towing Fort Worth? Unlike other towing companies, Towing Fort Worth comprises of experienced and meticulous auto lockouts who provide services such as assisting in a car lockout, ignition key replacement, replacing a dead battery, and any other auto lockout issue you may be facing. If you require an emergency car lockout along with a towing company, you have come to the right place! Not all towing companies in Dallas offer long distance towing, but Towing Fort Worth is willing to go the distance and at competitive rates. Light duty towing is easily accomplished with a flatbed tow. Dead battery? Out of gas? Car won’t start? Roadside service includes a tire fix, jump start, recharge battery, and even car replacement battery. Call Towing FW for reliable auto towing and roadside assistance. Our technicians are available at multiple locations so they can arrive at your location. When it comes to towing and recovery servicing and long distance towing, FW Towing understands the importance of quality towing and customer care. Towing Fort Worth and their network of licensed affiliates is one of the area’s premier Fort Worth tow truck and roadside assistance companies. Whether you’re in need of roadside assistance, such as a jump start, flat tire change or fuel delivery, or a Ft Worth tow truck service, such as dolly towing, flatbed towing, or long distance towing, Delta Towing Fort Worth is your Fort Worth tow truck expert. Available 24 hours a day, 7 days a week, 365 days a year, give us a call whenever you’re in need. We’ll have one of our professional and certified Fort Worth tow truck drivers to you so you can get back on the road. It’s important to make sure that you keep Delta Towing Fort Worth’s number in your cell phone whenever you find yourself in need of a Ft Worth tow truck. After all, roadside emergencies and towing needs can happen at any second, and thus having your Ft Worth tow truck driver on file will help expedite your service process! 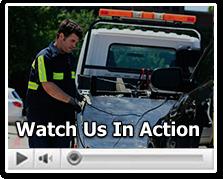 Don’t waste extra time looking for a Ft Worth tow truck driver or Fort Worth towing company. Remember Delta Towing Ft Worth is here for you whenever you’re in need! All of the above services are available 24/7 day or night. Save our phone number with you and call Towing Fort Worth for any car emergency. Whether you need a car replacement battery,a quick jump start, a tire fix or if you happen to get your keys locked in the car and need to unlock door, give us a quick call at our 24 hour towing line (817) 886-8332 and we’ll be with you in just minutes! When you call Towing Fort Worth, you’re calling an all-in-one solution for any kind of roadside problem. Call us the next time you need help and we’ll be there to help you. At your service anytime at (817) 886-8332. Our certified tow truck operators are standing by! Think of Towing Fort Worth as your trusted local emergency towing company.